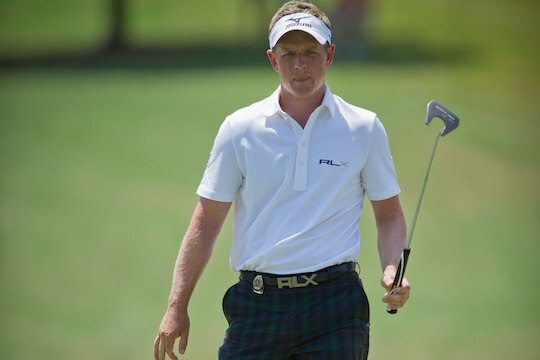 We shouldn’t jump to conclusions about Luke Donald’s chances of claiming the PGA Tour Player of the Year award but he is looking the goods for the title. The award may still hang in the balance – a baffling, open chapter that should have been closed on Sunday. After the Disney World, the PGA Tour announced it would be mailing ballots for Player of the Year voting this week, since the money title had been clinched and the last official event had ended. Then on Monday the PGA Tour instead elected to wait another two weeks after realising it had made a scheduling oversight, and will now postpone sending out the ballots until next month. With two co-sanctioned Asian events set for the next fortnight, a handful of players are still in the mix for top-player and top-rookie honours. The PGA Tour feels the players should be given the opportunity to make a last splash before ballots are mailed. The decision certainly makes sense, yet the timing for Donald is to his disadvantage. This week’s event in Malaysia and next week’s HSBC Champions event in China are sanctioned by the PGA Tour. Entrants including Keegan Bradley, one of seven players to record two victories this season, will have a chance to collect three titles. Current Masters champion, South Africa’s Charl Schwartzel, is also expected to play, and a victory could mean he closes in on Bradley’s Rookie of the Year honours. Add into the mix Webb Simpson’s efforts and Donald’s grip on the award becomes weaker with the passing of every week. Many believe that Donald nailed down the Player of the Year award on Sunday when he shot 30 on the back nine at Disney to win his second US event of the season, clinching the money title as well as two separate trophies for having the season’s best adjusted stroke average. After Webb Simpson carded four straight birdies, Donald answered with six in a row enroute to a 64. His win Sunday, coupled with Simpson’s tie for sixth, meant the Englishman wins the PGA Tour money title while also holding a substantial lead in the European Tour’s money race. “This was a tremendous year for me. I answered a lot of critics’ questions,” said the 33-year-old Donald and current world number one. Donald has recorded 14 top-10 finishes in 19 PGA Tour starts this year on his way to an average season adjusted score of 68.86. That puts him ahead of Simpson (69.25) and Steve Stricker (69.36). Donald is also on course to finish the year as world number one and has an opportunity to make history as the first player to top the money lists in both the United States and Europe in the same season. He leads the European Tour money list with £3.34 million, £1.14m clear of Rory McIlroy, with eight tournaments remaining. Webb Simpson is the one who started the year-end intrigue with the Player of the Year award by stating his intention to make a bid for the money title by entering the last two tournaments. Slightly behind Donald in earnings at the time, he took a big lead in the money race with a second-place finish at the McGladrey Classic the week before Disney. That prompted Donald, shooting for the money titles on both the US and European tours, to add the Disney tournament to his schedule at the last minute. Only a victory would allow Donald to take the money title and that’s what he got. Irrespective of the number of votes Donald receives for Player of the Year come early November and whether his colleagues give him the nod of approval, Donald will end the year on a high. “I’m very, very excited about my golf,” he says. Donald will see out the year playing Sun City, Dubai and the Australian Masters. “I’ve met most of my expectations,” says Donald. Donald has to be a shoe-in for the award and topping the European Tour Money List will just be icing on the cake.